Lindsay Dolan Clark sent in this one on behalf of her mom, Cindy Dolan, mother of Kacy Dolan. 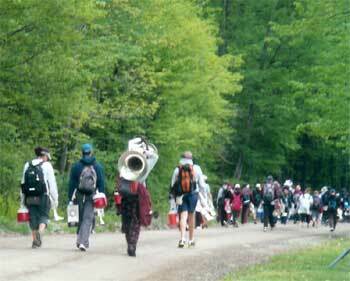 ""It's a long and winding road that leads the Cadets from Camp Cayuga to Championships in Providence! Here, section leaders Paula and Kacy and other dedicated members of the 2005 Cadets take an impromptu walk from brass sectionals to ensemble while at their chilly spring training camp in the Pocono Mountains a week ago (this pic was sent June 6)." Thanks Lindsay and Cindy!